Mavjuda Fozilova Mazbutovna, 32, lives in Khujand. She is married and mother of two. Her children are young and still attending kindergarten. She is a streamstress and her husband runs a transportation business. She set up her sewing workshop two years ago and already has a solid experience. Mavjuda applied for her first MDO Humo loan in September 2016, which was intended to repair her husband’s taxi so he could keep working. In March 2017, Mavjuda decided to get a second loan of TJS 5000 over a period of 18 months. This time, the loan was meant to help developing her own activity. She used it to buy fabrics, threads and other sewing accessories. Despite being new to this business, Mavjuda was able to attract more clients and improve her family’s living conditions. Here is what Mavjuda says about her success: "I love doing the best work possible to satisfy my clients’ expectations. However, my secret is not only the ability to create beautiful, high-quality dresses, but also the capacity to understand people. I offer each customer an individual approach. As a result, the customers completely trust me in choosing the style of clothing. After all, clothing for a person is not only a way to feel comfortable, but also an opportunity for self-expression." In the future Mavjuda plans to hire an apprentice. She is very grateful to everyone for their support! 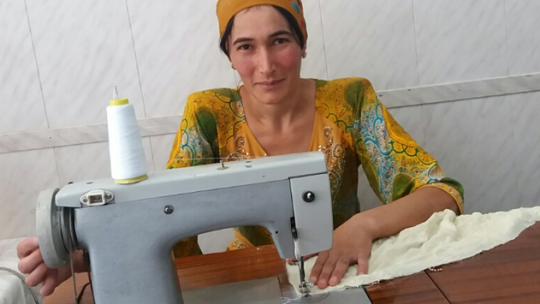 If you want to support others projects in Tajikistan < a href="https://www.microworld.org/en/projects?field_loan_type_value_many_to_one=All&second_level=1982&first_level=All&sid=4&field_entrepreneur_gender_value_many_to_one=All&items-per-page=#projects-list">click here.